Michael Schumacher (; German: [ˈmɪçaːʔeːl ˈʃuːmaxɐ] ( listen); born 3 January 1969) is a retired German racing driver who raced in Formula One for Jordan Grand Prix, Benetton and Ferrari, where he spent the majority of his career, as well as for Mercedes upon his return to the sport. 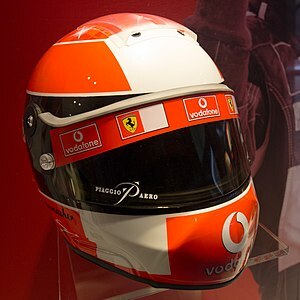 Widely regarded as one of the greatest Formula One drivers ever, and regarded by some as the greatest of all time, Schumacher is the only driver in history to win seven Formula One World Championships, five of which he won consecutively. The most successful driver in the history of the sport, Schumacher holds the records for the most World Championship titles (7), the most Grand Prix wins (91), the most fastest laps (77) and the most races won in a single season (13), and according to the official Formula One website (Formula1.com), Schumacher was "statistically the greatest driver the sport has ever seen" at the time of his retirement from the sport. Rule changes for the 2005 season required tyres to last an entire race, tipping the overall advantage to teams using Michelins over teams such as Ferrari that relied on Bridgestone tyres. The rule changes were partly in an effort to dent Ferrari's dominance and make the series more interesting. The most notable moment of the early season for Schumacher was his battle with Fernando Alonso in San Marino, where he started 13th and finished only 0.2 seconds behind the Spanish driver. Less than halfway through the season, Schumacher said "I don't think I can count myself in this battle any more. It was like trying to fight with a blunted weapon.... If your weapons are weak you don't have a chance." Schumacher's sole win in 2005 came at the United States Grand Prix. Prior to that race, the Michelin tyres were found to have significant safety issues. When no compromise between the teams and the FIA could be reached, all but the six drivers using Bridgestone tyres dropped out of the race after the formation lap. Schumacher retired in six of the 19 races. He finished the season in third with 62 points, fewer than half the points of World Champion Alonso. Schumacher was again partnered by Rosberg at Mercedes for the 2012 season. Schumacher retired from the inaugural race of the season Australian Grand Prix, and scored a point in the second race in Malaysia. In China Schumacher started on the front row alongside Rosberg on pole, but retired due to a loose wheel after a mechanics error during a pit stop. 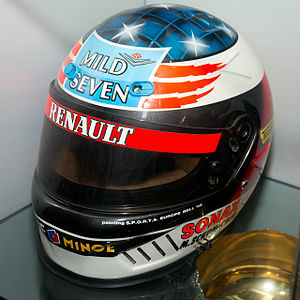 At the 1997 European Grand Prix at Jerez, the last race of the season, Schumacher led Williams's Jacques Villeneuve by one point in the Drivers' Championship. 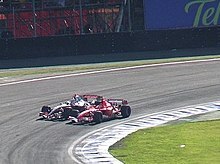 As Villeneuve attempted to pass Schumacher at the Dry Sac corner on lap 48, Schumacher turned in and the right-front wheel of Schumacher's Ferrari hit the left sidepod of Villeneuve's car. Schumacher retired from the race as a result, but Villeneuve finished in third place, taking four points and so becoming the World Champion. The race stewards did not initially award any penalty, but two weeks after the race Schumacher was disqualified from the entire 1997 Drivers' Championship after an FIA disciplinary hearing found that his "manoeuvre was an instinctive reaction and although deliberate not made with malice or premeditation. It was a serious error." Schumacher accepted the decision and admitted having made a mistake. Schumacher's actions were widely condemned in British, German, and Italian newspapers. 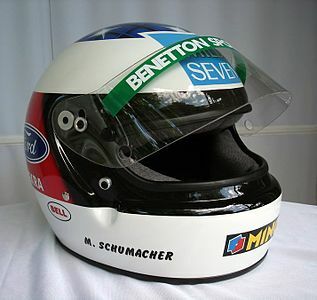 This made Schumacher the only driver in the history of the sport, as of 2018, to be disqualified from a Drivers' World Championship. In 1994, suspicion of foul play by the Benetton team (who were eventually found to have been responsible for some technical violations over the course of the season) was said to have troubled Ayrton Senna that season. For example, in the words of his then teammate, Damon Hill, Senna had chosen to spend a bit of time at the first corner of the Aida circuit following his retirement from the Pacific Grand Prix. After listening to Schumacher's Benetton B194 as it went past, Senna "concluded that there was, what he regarded, as unusual noises from the engine". The FIA subsequently issued a press release setting out action that it required teams to take prior to the German Grand Prix, given that various cars were found to have an advanced engine management systems emulating launch and traction control. Two laps from the finish of the 1998 British Grand Prix, Schumacher was leading the race when he was issued a stop-and-go penalty for overtaking a lapped car (Alexander Wurz) during the early moments of a Safety Car period. This penalty involves going into the pit lane and stopping for 10 seconds, and the rules state that a driver must serve his penalty within three laps of the penalty being issued. 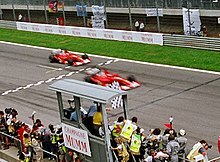 On the third lap after receiving the penalty, Schumacher turned into the pit lane to serve his penalty, but as this was the last lap of the race, and as Ferrari's pit box was located after the start/finish line, Schumacher technically finished the race before serving the penalty. The stewards initially resolved that problem by adding 10 seconds to Schumacher's race time, then later rescinded the penalty completely due to the irregularities in how the penalty had been issued. In August 1995, Michael married Corinna Betsch. They have two children, a daughter Gina-Marie, born 20 February 1997 and a son Mick, born 22 March 1999. He has always been very protective of his private life and is known to dislike the celebrity spotlight. The family moved to a newly-built mansion near Gland, Switzerland in 2007, covering an area of 650-square-metre (7,000 sq ft) with a private beach on Lake Geneva and featuring an underground garage and petrol station. On 29 December 2013, Schumacher was skiing with his 14-year-old son Mick, descending the Combe de Saulire below the Dent de Burgin above Méribel in the French Alps. While crossing an unsecured off-piste area between Piste Chamois and Piste Mauduit, he fell and hit his head on a rock, sustaining a serious head injury despite wearing a ski helmet. According to his physicians, he would most likely have died if he had not been wearing a helmet. He was airlifted to Grenoble Hospital where he underwent two surgical interventions. Schumacher was put into a medically induced coma because of traumatic brain injury; his doctors reported on 7 March 2014 that his condition was stable. 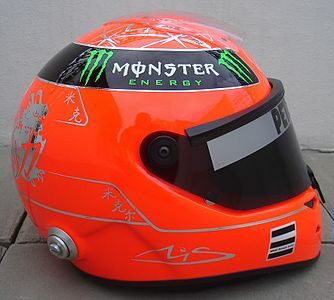 On 4 April 2014, Schumacher's agent reported that he was showing "moments of consciousness" as he was gradually withdrawn from the medically induced coma, adding to reports by relatives of "small encouraging signs" over the preceding month. In mid-June, he was moved from intensive care into a rehabilitation ward. By 16 June 2014, Schumacher had regained consciousness and left Grenoble Hospital for further rehabilitation at the University Hospital (CHUV) in Lausanne, Switzerland. On 9 September 2014, Schumacher left CHUV and was brought back to his home for further rehabilitation. In November 2014, it was reported that Schumacher was "paralysed and in a wheelchair"; he "cannot speak and has memory problems". In a video interview released in May 2015, Schumacher's manager Sabine Kehm said that his condition is slowly improving "considering the severeness of the injury he had". In September 2016, Felix Damm, lawyer for Schumacher, told a German court that his client "cannot walk", in response to false reports from December 2015 in German publication Die Bunte that he could "walk a couple of steps". Allen, James (1999). Michael Schumacher: Driven to Extremes. Bantam Books. ISBN 0-553-81214-9. Collings, Timothy (2004). The Piranha Club. Virgin Books. ISBN 0-7535-0965-2. Collings, Timothy (2005). Team Schumacher. Highdown. ISBN 1-905156-03-0. Domenjoz, Luc (2002). Michael Schumacher: Rise of a genius. Parragon. ISBN 0-7525-9228-9. Henry, Alan (1996). Wheel to Wheel: Great Duels of Formula One Racing. Weidenfeld Nicolson Illustrated. ISBN 0-7538-0522-7. Hilton, Christopher (2003). Michael Schumacher: The greatest of all. Haynes. ISBN 1-84425-044-X. Hilton, Christopher (2006). Michael Schumacher: The Whole Story. Haynes. ISBN 1-84425-008-3. Kehm, Sabine (2003). Michael Schumacher. Driving Force. Random House. ISBN 0-09-189435-2. Matchett, Steve (1995). Life in the Fast Lane: The Story of the Benetton Grand Prix Year. London: Weidenfeld and Nicolson. ISBN 0-297-81610-1. Matchett, Steve (1999). The Mechanic's Tale: Life in the Pit Lanes of Formula One. Osceola, Wisconsin: MBI Pub. ISBN 0-7603-0754-7. Williams, Richard (1999). The Death of Ayrton Senna. Bloomsbury. ISBN 0-7475-4495-6. What's the good word on Michael Schumacher?